Details.com lists Jsix as one the most exciting venues opening. Jsix makes the U-T's business section cover. 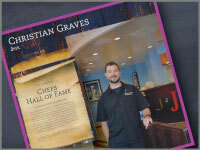 Chef Graves is added to the Chefs Hall of Fame by SDH&G. Four El Magazine interviews Nate Howell. Full spread on Dallmann Fine Chocolates in the U-T. The LA Times mentions Cusp in their La Jolla travel story. Cusp's meatless recipe is feature on Men's Health. Esquire's "Eat Like a Man" highlights Jsix bartender. The LA Times features Bread Service at Cusp. Good Morning America & Yahoo! feature LOUNGEsix. Sunset features a recipe from Jsix and Chef Graves. Full dining review on Cusp in Riviera Magazine.